Click to enlarge image in Pinterest & repin. A church that consistently and whole-heartedly exercises the one another commands of Scripture will rarely need to get to the point in church discipline where people must be removed from the church. Here’s is the flow of living out the one another commands of Scripture that starts with feeling like others care and ends with the motivation to change attitudes and behavior that are not Christ-like. Below you will find some of the one another commands of Scripture that correspond with each step. 1) People know one another and truly care about one another. They feel accepted (Rom. 15:7). They know others are truly concerned about them (1 Cor. 12:25). They are surrounded by people who are devoted to them (Rom. 12:10a). They experience the love of God through others (Rom. 13:8). 2) People who sense others care, feel safe enough with one another to share their struggles. They sense that others will bear with them (Eph. 4:2). They are able to confess their faults (James 5:16). They are able to experience true fellowship (1 Jn. 1:7). They believe their honesty (Col. 3:9) will be met with kindness (Eph. 4:32). 3) People who share their struggles can then be held accountable by and to one another. They are admonished (Col. 3:16). They are being built up, not torn down (Rom. 14:19). They can be honest and know others will be honest with them (Col. 3:9). They are prayed for and able to pray with others (James 5:16). They are spurred on (Heb. 10:24). They want to submit to others and the help they are receiving out of reverence to Christ (Eph. 5:21). 4) People who are cared for and held accountable tend to be more motivated to change. They aren’t in it alone because others help bear their burdens (Gal. 6:2). They feel encouraged, not condemned (1 Thess. 5:11). They are able to seek and receive forgiveness from others (Eph. 4:32). 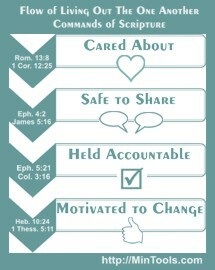 When the Body of Christ fulfills the one another commands of Scripture, people are helped early on in their struggles. Problems and sins are not left unchecked to escalate. Hearts tend to respond to true body life and so the hardening that leads to a lack of repentance rarely happens. One of the reasons the one another commands work is that they are built on the premise of mutual, reciprocal response toward each other. It is not a one-sided endeavor where the struggling person feels like it is “me” and “them” but rather “us.” They come to realize that we all sin and struggle to keep the Lord first in our lives and we all need to help each other become more Christ-like. Next → Next post: Trying to Attract People to Your Church by Becoming Like Them?